Ray Chambers: As Special Envoy, I have interacted with people touched by every facet of malaria, but nothing is as sorrowful as meeting a parent who has lost a child from malaria. At the same time, it is their stories that remind us that this is not acceptable and we cannot rest until no child dies from malaria. I recently sat down with Mrs. Jo Yirrell of the United Kingdom to hear her story. Ray Chambers: Jo, you’ve been incredibly generous with your time as an ambassador for Malaria No More, and your tragic story has moved so many people so profoundly. Would you share that story with us, and how it led to your activism? Jo Yirrell: Nothing can describe the intolerable pain of losing a child, I never imagined at the time that I would have the strength to get through my loss and live my life but I had my other boys, Bert, Berry and Buster and my husband, David, of (now) thirty years to support me, as I supported them. Harry contracted malaria in Ghana where he had been volunteering in a school, enjoying some of the best months of his life. He had given his malaria tablets away to the children as he thought they needed them more and that he’d be OK. In the first few weeks following Harry’s death, I quickly understood that his death from malaria, a preventable, curable disease was totally unnecessary. I struggled with our loss and felt a compelling need to do something to prevent others from losing their life to it. I wanted to make sure that no other parent would be in our position. And so I started to tell Harry’s story, firstly to other future travelers and then in 2009, I became a Special Ambassador for Malaria No More UK, a charity on the front line of the global fight against malaria. It became a form of therapy for me. Ray Chambers: No parent should ever lose a child, and your courage is admirable. It is hard to believe that in 2013, this still happens to a mother every minute of every day. Your story is different of course because death from malaria is not something that happens in the UK or the U.S., and I think that is what struck my friend Richard Curtis. Your story helped inspire him to create the film Mary and Martha. What has that been like? Jo Yirrell: I can hardly believe it. It’s a story about two mothers who have nothing in common except their shared loss of their sons. My own experience with the loss of my son Harry is reflected in the character of Martha. As a result, last week I was rubbing shoulders in Brussels with a fascinating group of people — from politicians and business leaders to staff from ONE, a campaigning organization that fights extreme poverty, and representatives from The Global Fund to Fight AIDS, Tuberculosis and Malaria (The Global Fund). We were with Richard Curtis for a screening of Mary and Martha. 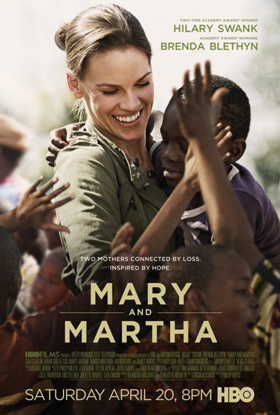 This week I am flying across the Atlantic for another screening of Mary and Martha, this time in Washington, D.C. In a strange way life is imitating fiction, and I hope that in some small way, by being able to tell my story, it will help keep the politics of malaria grounded in the lives of the people it affects. Ray Chambers: It must be surreal, but at the same time, you have such a powerful voice in this effort, and to know that you are helping to achieve something of such consequence, must be encouraging. What have you learned about the disease? What do you say to decision makers when it comes to increasing support for malaria? Jo Yirrell: It’s a bizarre combination of roles that I am currently holding, from my everyday life as a mum, teacher, school inclusion officer, chief cook and bottle washer to being a Special Ambassador for Malaria No More and speaker at events and interviews across Europe and now, America. Malaria costs less than a cup of coffee to treat. We can beat it but only if we sustain and increase resources, funding and political commitment to the cause. We need to keep the momentum going to win this battle. We have an historic opportunity to conquer malaria. But we must act now, and urgently, or we risk losing the gains that have been made. Malaria is a disease that is both preventable and treatable, the fight against malaria is at a pivotal moment and needs all the support we can muster, to push on and achieve the goal of ending deaths from malaria. We need everybody across the world to join the fight and help us to reach the point that we can say malaria no more. It’s been an amazing journey from my home in Leighton Buzzard to here, and I have learned so much along the way. I learned that the Global Fund represents over 50 percent of international financing for malaria, and that it’s a crucial year for the Global Fund, as it’s running short of money. And I’ve learned that cannot be allowed to happen. Ray Chambers: Jo, Thank you for your commitment. Is there anything else you would like people to know about you and your story? Jo Yirrell: I feel honored and privileged to be invited to D.C. and to be able to speak out against malaria to keep my son’s memory alive. In truth, however, I would rather not have been invited. I would rather not have been the inspiration for a character in a film, even if it was written by one of my favorite writers. I would rather never have met David Beckham when Malaria No More UK launched or former prime minister of the UK Gordon Brown. I would rather never have done any of these things, because none of it comes close to having my Harry. Malaria took Harry from me when he was young. If I wasn’t in America, maybe I could have been at home with Harry and his brothers. Maybe I could have been cooing over Harry’s children, my grandchildren. But I am here, saluting the U.S. government’s commitment to the malaria fight and asking people to support The Global Fund. Asking African Ministers of Finance who will be in D.C. for the meetings of the World Bank, to use their World Bank funds to invest in malaria. Asking people to tell their governments that they care about malaria, that they want to stop this child killer from taking another life. I will be there sharing my story and my hope that Harry’s death won’t be for nothing. I have to be here.